It can come to you in many ways. Whether it’s Grandma’s gold ring that she left you after she passed away, or your favourite aunt’s shiny necklaces that she kindly gifted to you. Inherited or handed down jewellery brings a lot of joy and happy memories to some. But for others it can cause a lot of grief and headaches as they ponder what on earth to do with the sparkly items that are neither flash nor stylish, and don’t even fit. So, what should you do with your handed down jewellery? Basically, you have two options: keep them or pass them on. Before you decide which path, you want to pursue, here are a few thoughts to consider. Have a sit down and go through every single piece of jewellery that you got given and make an honest assessment. Which rings, brooches, necklaces or bracelets will you wear on a frequent base? Which items hold memories so dear to you that you can’t bear the thought of parting with them at all? Put the ones aside that you clearly don’t want, whether it’s because they’re out of fashion or totally not your style. With the ones you would consider wearing, it’s best to try them on in front of a mirror to see if they meet your expectations. Sometimes we love looking at a piece from the distance and dream about how well it would go with our favourite piece of clothing. But when we do put them on together we often realise it’s nothing like we had imagined. In those cases, it’s almost better to sell them on and turn them into cash rather than cry about the disappointment. You could also consider passing special family heirlooms on to someone else within your family, whether it’s your siblings or your children and grandchildren. If there are pieces that you like, but that are broken or don’t fit you, you can always consider having them fixed or resized for a reasonable price. Whatever jewellery you have decided you really don’t want for various reasons, doesn’t have to end up catching dust in the bottom of your jewellery drawer. 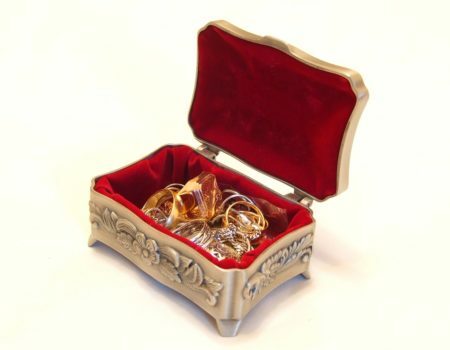 It can still be of good use to you: By turning it into cash your handed down jewellery can help pay off a debt, save up for a holiday or buy yourself a nice piece of jewellery that you do love. And you never know how much it can be worth. Handed down jewellery might have lost in value due to being old fashioned, dented or stained, but if it contains gold you might be getting a lot more buck than you can imagine. The process is easy and straightforward. If your jewellery contains gold, The Goldman is happy to assess your items for you based on the content of gold (purity), the weight and the daily price of gold. We give you a quote which you can accept or decline. Simply get in touch with us and we can help you decide what the best option for you might be.